Hey friends! It's Odie here today, hopefully by the time you read this Saturday I am in New York. As I write this on Wednesday morning and we are still sitting in Dodds church parking lot. I am sitting in the Green Machine waiting on my parents so we can get "On the Road Again! I was trying to take a nap while I was waiting on them. Is it crazy 57 degrees outside so it's too cold to take a nap. LOL I cannot believe this weather for the end of July! Since a nap was not coming easy I decided to go ahead and work on todays blog post. On Monday we had a great time at my Mamaw's 70th birthday party! Tuesday we met our new friends Nick and Terry and Greg and Jan.
We gladly introduced them to Acapulco. I think they enjoyed our pick of restaurant. I knew Greg and I were going to be fast friends when he pulled out his phone to get a picture of his food. LOL. I enjoyed hearing about all of their RV travels! We had a real nice visit. As Dad already mentioned we went to hear the Isaacs Sunday night. Revival at Beechfork Holiness Church near Wartburg, Tennessee ended on Sunday morning. As soon as possible we headed the Green Machine toward Athens, Tennessee for the evening. It just so happened that one of the Isaacs bus stops for the weekend was in Athens that night. By now you all should know I was very very happy! We had a wonderful time getting to visit with them before the concert! A little before 6:00 we slipped into the church. I am so glad that our seats were reserved because the place was completely packed! Our front row seats quickly became second row, when they added a row of folding chairs in front of us. There were folding chairs every where. People were sitting on the floor and standing along the wall. I would say the Isaacs have a few fans in the area! There were several new fans made that night as well. A young bluegrass group named Forgiven did a wonderful job starting the evening off with a song. Their bass player was unable to make the concert but Ben did a marvelous job filling in for them on the bass. Then it was the time we all have been waiting for! The Isaacs took the stage and opened up with "Walk On". For the next hour and a half it was beautiful singing, lots of laughter and a few tears that made for an amazing night. They sang many songs, and I cannot remember all the list. Each song was performed with superb talent that completely blows me away! The Isaacs will forever be my favorite group and my favorite people. It was an inside concert, but it was hotter then a lot of tent revival services. At one point in the concert the thermostat on the platform was registering 85°. We were all quite sweaty by the end of the night. The Isaacs did not let the heat stop them from giving an outstanding performance! A special highlight of the night was when they sang "I Wanna Be There". It is always special for me to be in the crowd when they sing this song they wrote about me and Gordon Mote. It always brings me to tears!! When my alarm goes off daily on my phone it is set to my favorite lines of the song. She's always dreamed of walking, folding up that wheelchair and being free. She loves to hear the story of how Jesus healed the lame man. I know one day she's gonna walk just like he can. I am looking forward to that day! I hope it happens today but I am determined to trust God. As Dad says often, "We are going to believe God to do our miracles today and live for Him just like He already has!" All too quickly the last note of He Ain't Never Done Me Nothing But Good was complete. It was time for them to start loading equipment into their bus so they could be on the road. The time came for us to say goodbye. I told you several weeks ago that my aunt Lily Isaacs now has her autobiography available. You Don't Cry Out Loud is a wonderful read that I highly recommend. You buy the actual book or buy it as a download it in Kindle. 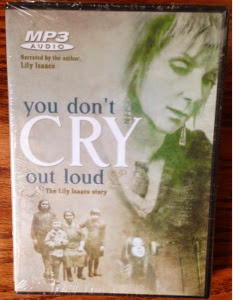 It's available for order in print or on CD at http://www.lilyisaacs.com/p/place-order.html. Also it is available for download on iTunes. Even though i have read it, I plan to listen to it during our travels on this current trip. In other exciting Isaacs news. Sonya Isaacs Yeary and her husband Jimmy will make Ayden a big brother early next year! I am so excited about their new addition. I am finishing this up on Saturday and we are now in the NYC area. The 9/11 Museum was amazing yesterday. Dad will be posting pictures shortly. Thank you for coming along for the ride! Who knows where where we will end up? Have a great weekend!